If you're the trustee of a parent's or other family member's estate, it will fall to you to distribute his assets and wrap up his affairs. Depending on the size of the estate, this can be a lengthy process that can take anywhere from six months to two years and involves a lot of work. But think of it as an indication of the person's trust in you: He knew you would handle his estate the way he desired. The process doesn't have to start immediately following a death, says Jennifer H. Friedman, a trusts and estates attorney in Menlo Park, California. Give yourself time to grieve and be with family. "You don't need to run from the funeral home to the attorney's office," says Friedman. "This is an extremely emotional time. Usually, people are overwhelmed when they walk in my office. Hopefully, they'll be less overwhelmed when they leave." If possible, you'll want to see a trusts and estates attorney within a month of the death. Ideally, this will be the same attorney who drafted the will and established his revocable living trust. "The sooner you get started, the sooner it's over," Friedman says. And she finds that some people like having tasks to do -- it helps them cope with their loss. The firs t thing to do is get a copy of the deceased's estate plan documents, including the will and trust, if one exists. Often, his attorney will have one, or it will be in his safety deposit box. Then, make an appointment with a trusts and estates attorney in the state in which the deceased resided. His will and other estate plan documents will have been drafted applying that state's laws, and you'll need an attorney licensed in that state to lead you through the process. In many states, like California, having a will and revocable living trust makes the process of administering the estate much easier, as it can be handled outside the court system. Some older adults, however, particularly those who lived through the Great Depression, are suspicious of trusts, which require them to retitle their assets when placing them in the trust. If that's the case, the estate will have to go through the court system (probate). In California, this applies only if the value of the assets, excluding retirement assets, trust assets, and joint tenancy assets, is greater than $100,000. That means your job as executor of the estate will be overseen by the court. It's a longer, more cumbersome, and more expensive process, and you'll want an attorney to assist you. In either case, you'll be able to pay your attorney from the deceased's estate. Most trusts and estates attorneys bill by the hour for this work; expect to pay $200 to $500 an hour. In California, for example, administering a revocable living trust with assets of $2 million or less will probably cost about $5,000 to $8,000, Friedman says. Estates of more than $2 million require a federal estate tax return, which is complicated and will increase the cost. If the deceased's estate needs to go through probate, many states provide that the attorney is paid on a sliding scale based on the assets in the estate, and then only by court approval. Friedman offers her clients the lesser of her hourly rate or the statutory fee; ask your attorney for the same courtesy. That's not the only cost you'll encounter: In Virginia, for example, the estate is taxed $1.33 for every $1,000 that flows through the probated estate. This tax is paid to the circuit court administering the probate case. At your initial meeting with the lawyer, she'll explain your role as trustee of the trust or executor of the estate. "That person has a fiduciary responsibility to manage the estate," says Friedman. The attorney, however, will guide you through this process. Your first homework assignment will likely include getting copies of the deceased's death certificate and a statement of assets and liabilities. This should include a listing of all assets, bank accounts, life insurance policies, annuities, and investments, as well as a list of all outstanding debts. You'll want to start collecting the monthly statements on the deceased's accounts, so you can estimate their value on the date of their death. If the deceased forgot to place an asset in the trust, your attorney may have to go to court to have it put in the trust. If the deceased's assets will be distributed outright to heirs, the matter is a relatively simple one. However, if the estate plan calls for the creation of subtrusts (to hold assets for future generations, or control the distribution to beneficiaries), those trusts will need to be drafted and then funded, which means changing the titles on assets. Those trusts will then need to be administered and invested appropriately by you as trustee. If the gross value of the deceased's estate amounts to more than $2 million, your attorney or CPA will need to file a federal estate tax return. This should be drafted by a professional with experie nce in the area, says Friedman. The tax return and estimated taxes need to be filed within nine months of the death. Even if you file for an extension to file the return, the estimated tax still needs to be paid within the nine-month deadline, Friedman says. While you can obtain an extension to pay the taxes due, the IRS will begin charging interest on any unpaid amounts beginning at the nine-month deadline. In the next few months, you and your attorney will tally the deceased's debts and liabilities, determine which are legitimate, and pay those accordingly. If the deceased was your parent, you aren't personally responsible for his debts. If his debts exceed his assets, you're not required to pay off the balance. You and your siblings will now need to make some decisions, though you shouldn't feel rushed into action. For example, it isn't necessary to sell your parent's home now, says Friedman. "Assets don't have to be converted to cash in order to distribute them," she says. The trust can continue to own the home, with any rental income distributed to the heirs. Or, if the trust is to be dissolved, the children may choose to own the home jointly and sell it later, when the market is stronger or when they finally feel able to let go of the family home. During this time, your attorney will also weigh any challenges to the will and estate plan; for example, if an heir disputes how the assets have been allocated. Friedman encourages her clients to settle any such disputes out of court rather than resorting to litigation, which is time-consuming and emotionally taxing and can eat up the disputed assets. "We usually try to mediate the dispute in some way," she says. Several small items can complicate an estate, and these vary by state. In California, for example, any gift of more than $3,000 to a nonrelated caregiver is automatically deemed void, unless the provision was reviewed and approved by a second attorney at the time the deceased drafted his will. This is designed to protect elderly persons from being manipulated by a caretaker. But the definition of caretaker can be a matter of dispute, Friedman says. It may include unpaid caregivers, such as a neighbor who has given the deceased rides to the store, paid his bills, and helped with issues around the house. If the deceased specified gifts for such individuals, a good trusts and estates attorney will have spotted this at the time he drafted his will and ensured that the will was reviewed by a second attorney or that the gifts were below the threshold for triggering a review. After disputes have been settled, bequests to charity made, taxes paid, and assets distributed to heirs, the estate remains open. Friedman recommends holding back some amount for any future liabilities that may arise. For example, once you file your federal estate tax return (only required if assets are greater than $2 million), it can take the IRS up to three years to approve the return. Until it's approved, it's wise to hold back money for additional taxes and any professional fees for the attorney and accountant that may be required. Once those matters are concluded, a final distribution can be made from the remaining assets in the trust. If the estate goes into probate, it will be handled similarly, says Friedman. Once the assets are inventoried and the creditor claim period has passed, your attorney will petition the court for a distribution from the estate. Again, a small amount will be kept in reserve to pay unforeseen expenses until a final distribution is made. Handling an estate is time-consuming and involves a myriad of menial tasks, Friedman says. "It's a lot of work, but in the end, you are fulfilling the deceased's final wish," she says. That thought should help ease you through some of the minutiae. 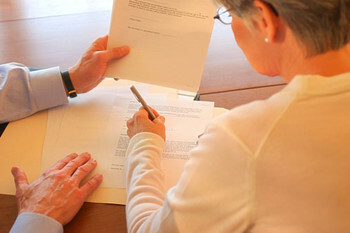 Do I still have financial power of attorney after the death of my mother? How soon after my parent's death do I need to begin administering will, and what's involved?